What is the Global Logistics Gateway? The Global Logistics Gateway enables Carriers, Freight Forwarders, Orchestrators, Distributors, Custom Brokers and Suppliers to execute the global fulfillment and transportation process via a single access point. 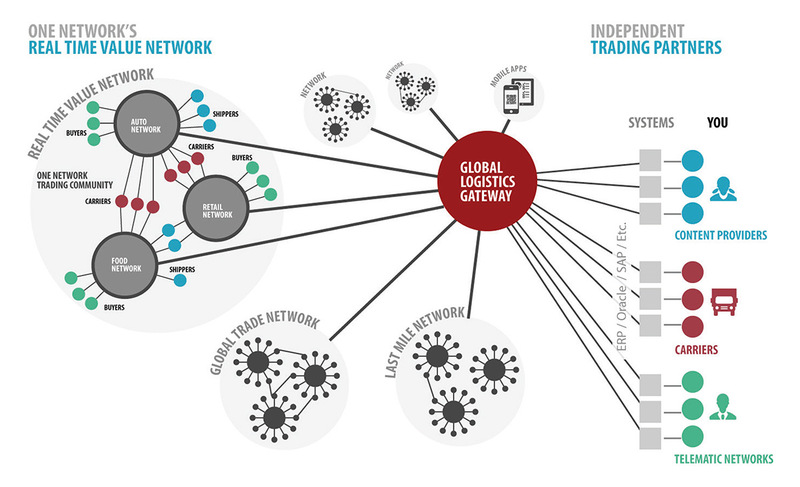 The Gateway connects with business networks for sales, procurement, freight, and logistics services, to create a ubiquitous network of networks at global scale. The Gateway supports interoperability between supply chain operating networks through open standards-based authentication, and public API-based process orchestration, to any buy/sell system or any transport management system (TMS). Using One Network’s Global Logistic Gateway, we are able to deliver enhanced operations planning, execution and process orchestration solutions to our clients, and achieve excellent results. Shippers can now be a one-stop shop for customers. The Gateway enables shippers to post purchase, sales or transport orders via a single system. It connects and transacts with in-country and international carriers, freight forwarders, customs brokers, last mile operators, and other partners, to streamlines fulfillment and transportation functions. Carriers and freight forwarders can use the solution to transact with shippers to fulfill the transport demand and collaborate on freight orders; schedule appointments; post capacity, and publish the tracking events. They can also leverage services to manage their internal processes, and subscribe to network analytics and industry benchmarks to continuously improve their operations. The carriers and all other trading partners each only have to onboard once to the Global Logistics Gateway, and then GLG will connect them to other popular TMS systems, and buy and sell applications such as ERP systems procurement and other business networks etc. Buyers and suppliers can connect and transact with each other and with logistics trading partners in operating fulfillment and transport operations. They can also post un-sourced orders and leverage advanced services such as sourcing, collaboration, demand and replenishment planning, and promising. The network will manage fulfillment and delivery across multiple modes, support all combinations of prepaid and collect legs and all Incoterms. Milestones and tracking events are provided for all orders and shipments and companies can post forecasted demand, as the Global Logistics Gateway will convert into sourced orders and then collaborate with the trading partners to manage the fulfillment. In addition, One Network offers a highly differentiated Global Supply Demand Match Service that optimizes inventory, service levels and freight costs. This process allows all freight to be treated as “moving warehouses” and allows inventory to be allocated and reallocated while in transit. One Network is also announcing a Global Logistics Partner Program. This expanded marketplace supports three kinds of partners: service, content and software providers. Service providers such as traditional 3\4PL and freight forwarders can now offer higher value “orchestrator” capabilities that allow the complete outsourcing of the end-to-end global fulfillment process. Content providers can offer syndicated content such as weather and traffic, and software vendors can offer useful applications. One Network’s Global Logistics Gateway solution is a global “network of networks”. Speed up your digital transformation by connecting to a vast digital network that embraces other buy/sell logistics networks.